This guide describes the basic navigation of the Assignment Scoresheet (School Loop Plus). The assignment scoresheet view contemplates a single assignment. This view is useful when you wish to enter scores and comments for all student in different periods who have received this assignment. 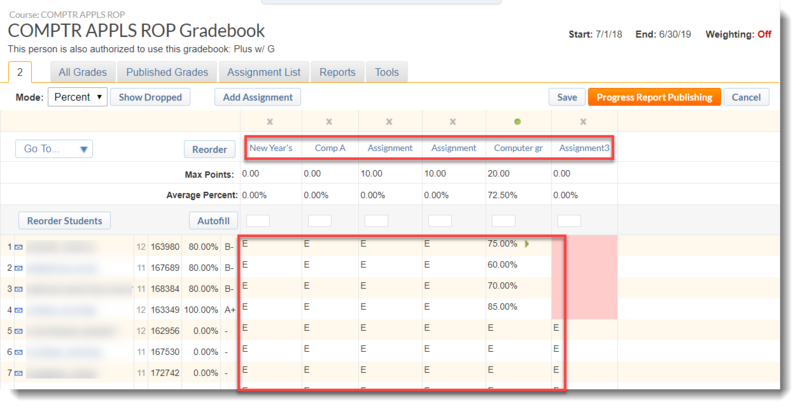 From the main Gradebook spreadsheet, click the title of the assignment at the top of the scores column. 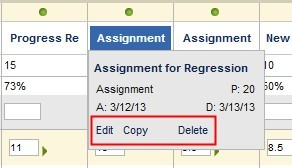 Alternately, clicking the title of any assignment listed in the Assignment List tab will also take you directly to the assignment scoresheet. Note: Hover over the title to view the details pop-up window, which includes the options edit, copy and delete.